2010...let's not do it again! Well, it's the last day of the year. A sigh comes out of my mouth...with relief. Yes, it is only a day...nothing magical does happen at midnight...except my attitude, hope and belief. The year 2010 has been THE worst year of my life. This blog that I am writing has been stewing inside of me for weeks. I knew I was going to write it. It's like I need to get everything off my chest. For those of you who follow my blog, may know bits and pieces of it...but now, here it goes. We finally made a huge decision. It was difficult. I dragged my feet...a little bit, no actually a lot. We let our daughter, who is weeks away from turning 14, get a Facebook account. AAAAHHHHH! It was so hard. I fought this for a long time. Matt wanted to do this for the past month or so...and I just wasn't there. Bryn, of course, wanted one for a long time. I, absolutely love Facebook. I love making updates...I love reading what other people are doing. And I love seeing my family grow and change, which I would have missed out on because they live in NY. The same goes for a lot of other friends that I wouldn't talk to much if it wasn't for Facebook. 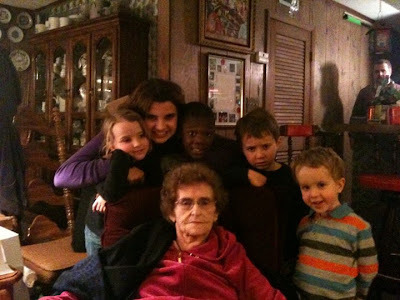 The first picture is generational...all my kids surrounding their 91 year old great-grandmother. She has been a blessing to all of us...we have so many Christmas memories of her every year on Christmas Eve. I believe this is the first present that the kids opened up, after their stockings. They are all quite eager and ready to rip in. Judah and William...holding the controls to their monster truck and race car. Love this picture of them...so sweet and ready to smile for mommy! Here is Matt, later that day on Christmas...looking tired from not enough sleep and a busy morning. Even so, he is so handsome and I love him so much! Esther holding her new stylish, winter boots and in her new robe. I have to keep this skinny girl warm some how! Caleb in his new jammies and holding his new glove that he got from Nana. He was so excited later that he could catch the ball in the glove! The Tale of Three Trees. A little book that we started reading before Christmas. To keep our mind focused on the real reason that we celebrate this holiday. The kids listen and it brings us together...after a noisy breakfast of homemade apple fritters, eggs, sausage, and potatoes. If you haven't read this tale, take a peak as soon as you can. And so the baking is complete! Our last food project for the holiday season was dipping pretzel rods and Oreo cookies in white and milk chocolate. The kids had fun...sprinkling all the colors on them and of course licking their fingers. What a delightful season it has been! I have spent more time with my kids then I have any other year. It has been magnificent. Have a fabulous day! I thought that instead of posting another set of pictures of my kids baking, I would put up the picture of the mess they left over. They went to Nana's house yesterday with their cousins and decorated gingerbread cookies...as they have done since Bryn couldn't walk yet. They had a fabulous morning...icing the cookies, decorating with sprinkles. Each child had their own style and each set of cookies came out differently. The most important part was that they had fun...as you can see by the mess leftover! I woke up this morning to him singing softly in his sleep, "I want mommy. I want mommy." He continues to steal my heart. As much as these boys of mine are rough and tough...they still are so connected to me. I am blessed. 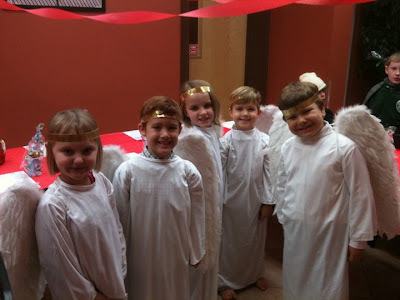 Here is our angel, playing an angel at church. Our babygirl was in her first play...with two whole lines to say in fron of the congregation. She did such a good job...quite angelic. Boys will be boys! Playing outside our friends house...on the only hill in Florida...lol. Skateboards and scooters. Funny thing is that the little boy in the green shirt also has the name Judah. He kept on giving me funny looks every time I called my Judah. And William loved riding on the skateboard. He told me when we got home that he wants one so bad, and he is going to save all his money for one. Little does he know, that he will have one under Nana's tree on Christmas. Esther painting cookies yesterday. Our little budding artist did a fantastic job. Our little bear...he liked the skateboard also. He is a "me too" kind of a boy...he will never be left behind. A typical serving of spinach and artichoke dip contains up to 1,100 calories and 100 grams of fat, which is almost a day's worth of calories! Substitute high-fat cheese for fat-free Greek yogurt to keep the creamy texture while slashing more than half the calories and artery-clogging saturated fat. 2. Mix ingredients; spoon into 9-inch quiche dish or pie plate. Here he is...Baby Duncan made his appearance yesterday on December 17th at 5:13 p.m. Very short and fast labor for mommy and a very healthy five pounds six ounce baby boy. It was an honor to be there with my best friend to welcome the newest addition to her family. We worked on our annual Christmas tradition yesterday...our Christmas Countdown. Yummy Hershey kisses to rip off each night ten days before Christmas. My kids favorite thing to do each Christmas. Esther armed with her candy...me with the glue gun! Here is Judah picking out his candy for his Christmas countdown...he wanted to eat one so bad! My mini-man and me! I love this boy! Great shot of Caleb! He had a wonderful day! Bryn and I goofing off! 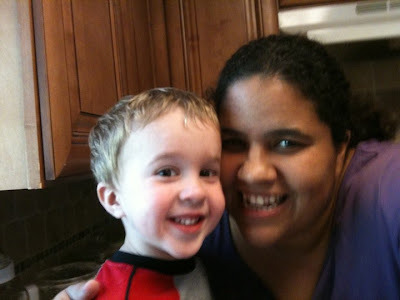 I snapped this yesterday of Judah and I when we were making cookies. Loving him and so blessed by him. Sometimes I read about people who live in farming communities up north and families taking advantage of the cheap prices....and it makes me so jealous. 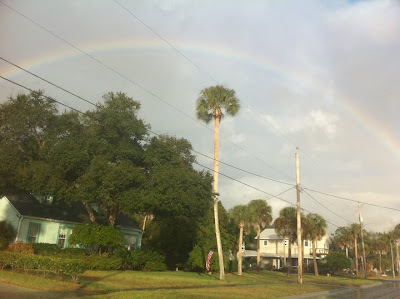 Living in Florida, we don't have the same advantages until... you remember about our fruit crops. My friend called me the other day and said a neighbor wanted her trees plucked of all the fruit before the freeze we are expecting this week....and we could keep whatever we picked. Harvest time! We met over at her house and walked over to the neighbors...and for the next two hours we picked two wagon loads full! So awesome! We divided the harvest up and I brought home about five bags full of fruit. My kids (who are fruit lovers) practically toppled me at the door. I will be cutting a lot of oranges in the next few weeks. 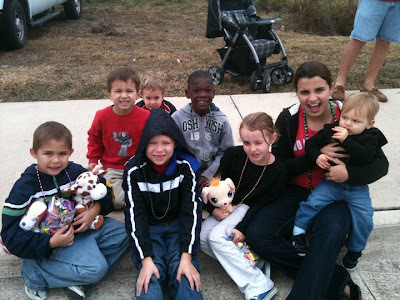 The Edgewater Parade was yesterday...and we met up and had a great time with the kids. We sat at the beginning of the parade route, because a friend let us park at her house. Over half of the cousins showed up...and they love being together. When Luke showed up (he is in a stroller and is only 1), seven little kids swarmed his stroller...you should have seen the delight on his face. Because we were at the beginning of he parade route the kids were showered with Candy. All the kids came home with individual quart bags full, and then I filled another gallon jar when we got home (tucked away for future use). 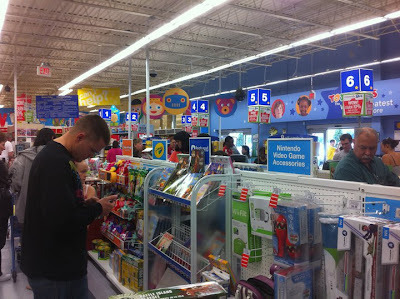 They also got stuffed animals, coupons and toys. They had so much fun...together. That was the best part of all! 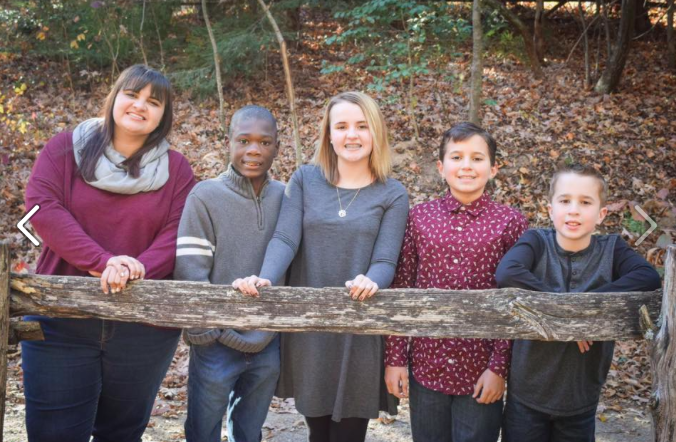 Here is a picture of them all...Xavier, William, Judah, Zachary, Caleb, Esther, Bryn and Luke. 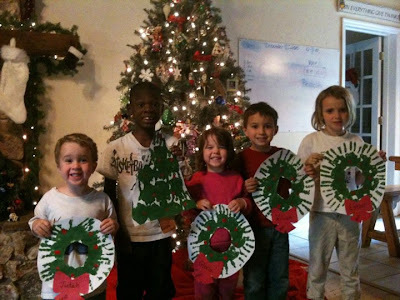 Here are the kids yesterday after we worked on our special Christmas wreath project. We invited our little friend Gloria to come help us. I got the idea from a teacher friend who helped make Caleb a wreath 3 years ago in school (notice Caleb made a tree instead since we already have a wreathwith his handprints on it). Their hand prints are forever printed down on this cute project. 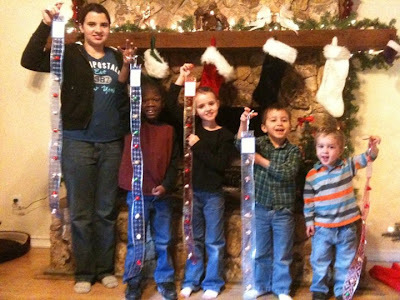 The kids love any kind of craft you give them...and when you wrap it up with Christmas it is that much sweeter! I copied this recipe from one of my favorite blogs. Simply fabulous, and easy recipe. Made it last night and it was a hit! Cook ground beef in a large heavy skillet and set it aside. Wipe excess grease from skillet . Peel onions and puree them in a food processor (or mince them very fine). Peel and mash garlic. Peel and chop potatoes into 1 inch cubes. 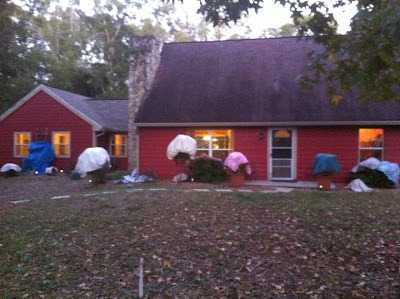 I can't remember the last time in early December when we had to cover our plants...but that's exactly what we had to do last night. Matt invested a lot of time and money this year to his garden and he wasn't prepared to lose it. The low this morning...29 degrees. In December? Amazing. Perhaps we will have another cold winter like last year, or it's just a fluke. We will see. Either way, we are loving every minute of it. The kids are snug in their beds and the air is crisp. What a beautiful morning! Here is the "Christmas card picture" that Matt took last night when everything was done. 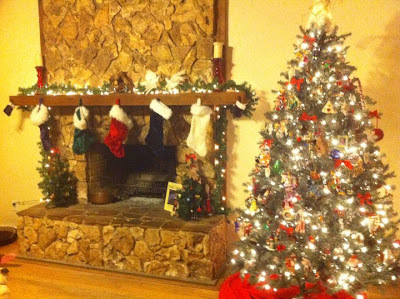 The tree looks beautiful...the stockings hung on the fireplace and our two little trees on the hearth. So lovely. The kids were munching on pinwheel cookies while we decorated the house. Judah looks happy! The kids surrounded Matt, waiting for their turn to put an ornament on the tree. They only put the one's up that weren't breakable. We have a lot of old ornaments that we wouldn't let them touch. Esther holding her first ornament from 2003. Each child gets a new ornament from us each year. By the time they move out and marry they will have enough to decorate a tree! Bryn and Caleb stop for a minute for me to snap a picture. Esther is in the back trying to place an ornament. 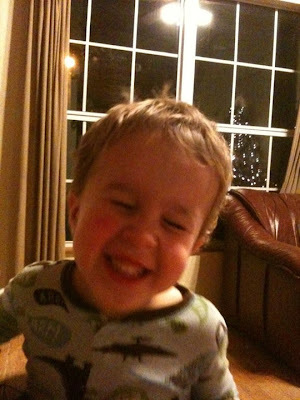 Judah loved putting ornaments up...last year he did a lot of running around and laughing. Needless to say though, we had to reposition a lot of ornaments this year, lol. 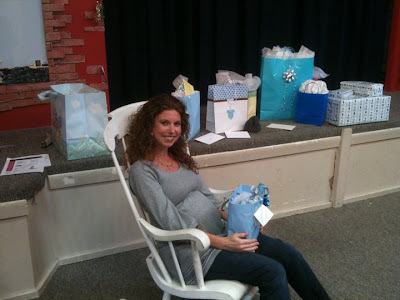 Here is the mom-to-be, my best friend, Jessica. She is pregnant with her fifth baby, but her youngest is 9 years old. It's like starting all over again. Here is Irene Negedly (Jessica's aunt and my friend), Jessica and Me. Here is the cake that my husband made. So beautiful. So elegant. He is so talented. The food table, decorated with a mixture of baby blue and Christmas. My goal was simple and elegant, and I think I achieved that. Here is the cake table, with punch and cookies. Everything looked so pretty. Jessica's aunt, Jessica and our long time friend Marina Owens. Marina was in town from Tennessee, and it was so good to see her. I have been getting up so early since before Thanksgiving. My hour to start the day has been around 5:30 in the morning. Still dark. House quiet. No objections to that. So, I have been able to have my quiet time with the Lord...prayer and reading the word, without any interruptions or noise. Quite blissful, actually. The only bad thing about this hour...is that by eight o'clock at night I am ready to crash. I need to adjust a bit to this new rising hour. I am up early this morning baking cookies. My best friend's shower is this afternoon. So, I am in preparation mode. Getting everything ready...lists made...crystal brought down...any last minute work that needs to be done. My sweet husband made the cake last night...stayed up late to bake it. How kind, since I was ready to crash. So, all is well here. I am posting a picture of my little cutie, Esther. Such a blessing she is. I make peanut butter balls (or some call them buckeyes). It is a tradition that my mother handed down to me. It's her recipe. But I never make them any time of year...only at Christmas. The kids expect them. And I love to make them. And my daughter Bryn is always wanting to make them too! Matt's boss, loves them! But he asks for them all year long...so as a surprise (for the 2nd year), Matt will bring these to work today for his boss. A little gift for him...to let him know that I appreciate how favorable he has been to my husband. So, I am declaring a great December. Full of cheer, love, joy and most of all PEACE! Peanut Butter Balls 1 cup sugar 1 cup peanut butter 1 cup graham cracker crumbs Mix all together. Make them in to small little balls. Melt chocolate on the stove (not too high or use a double boiler). Dip the balls in the pot and roll them around to be covered with chocolate. Put on wax paper on the counter to make them easy to put on separate serving tray. Yummy!